Jewelers on the island of Java work in open-air studios creating the sterling silver beads that have been a local art form since the 16th century. This bracelet begins with a technique called repoussé where designs are hammered into a sheet of metal. The textured metal is then curled into a long cylindrical bead, and a mold is made. 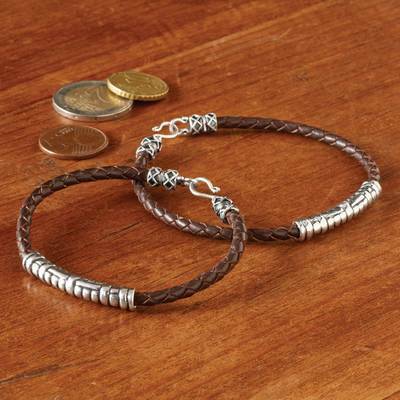 Sterling silver beads cast from this original mold are then slid onto a braided leather cord to make a handsome bracelet that flatters both men and women. You can find sterling silver and leather bracelet 'Java Groove' by National Geographic in jewelry categories such as Nat Geo Bracelets, Nat Geo Sale Bracelets, No Stone Bracelets, Leather Bracelets, Silver Bracelets, Sterling Silver Bracelets, Braided Bracelets and Wristband Bracelets. Enjoy exploring these sections for other Novica treasures. This should be labeled as small and large and have a measurement. This bracelet was too large for the male that I bought it for. Nice design and quality, although there seems like a strong likelihood of losing the bracelet since it is only a hook not a clasp. Returned for refund. "Men's Silver & Leather Bracelet"
Husband loved it; unfortunately, it slipped off the 1st time he wore it and was lost. A complete re-design of the clasp is needed. "Not quite what I wanted"
My children gave me this as a retirement gift -- they call it my "hippie bracelet." I like it a lot -- it's simple, elegant and beautiful -- and I wear it all the time. As others have noted, though, the leather is quite thin -- 3 mm in diameter -- and the silver bead slides around freely. The bead mostly settles next to the clasp where it's relatively hidden. Also, because the clasp is just two hooks of silver wire, you must either leave a gap in the clasp end that's an open hook or bend the hook shut. When I left a gap the bracelet sometimes fell off, so I bent it shut and wear it all the time. I've had two problems in the three months I've had the bracelet. First, the leather stretched from the original 8-1/2" to 9", becoming uncomfortably loose even for a 6'-6" 250 lb guy. Then the leather itself broke, right at the clasp. I fixed both problems by trimming back the broken end of the leather and reattaching the clasp. It's solid again -- for now -- and it fits me better. Without the right kind of craft tools, though, it wouldn't have been easy. I recommend that the Javanese jewelers make two design changes: 1) Use a 5 mm diameter leather strap; the silver bead would fit more snugly and the leather would be less stretchable and prone to breaking. 2) Use a more robust and effective -- but equally pretty -- clasp. The braiding was too thin and the silver band slid around like a charm on a ladies bracelet. It wasn't a masculine bracelet at all! "More attractive to women than men"
My husband wore it for a few hours but has never worn jewelry other than a wedding ring and watch. I think if it were not so loose he may have liked it, and he is large boned, though thin. It bugged him that it slipped around; the decorative part was also always underneath where it didn't show anyway. I liked it, though, and thought it looked cool! "Interesting but thinner than expected!" This bracelet is more delicate than it shows! It is almost 9" in length (men's) and the leather itself is very thin. The silver beads slide around on the braclet instead of being complacent. The closure is fancy but the hook is easily bent, so be careful not to press too hard to latch. This is pricey for what it is and I don't recommend it for that reason. I was disappointed in the bracelet. I purchased one for my husband and one for myself for our anniversary. From the photo in the catalogue and on the website I expected the leather braid of the bracelet to be much more substantial. I was prepared to return them both but my husband liked his so we decided to keep them.